I have always been taught that things need to start well in order to end well. That is what immediately came to mind when I ran into an old friend on my first day of tastings in Piedmont this past summer. Within a few minutes a bottle of the 1982 Monfortino was open and conversation was flowing. What a great way to start a trip! 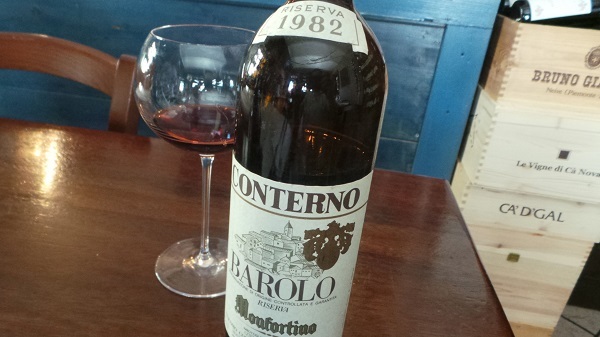 Conterno’s 1982 Barolo Riserva Monfortino has long been one of my very favorite wines. The 1982 has been peaking for the last few years. I keep thinking it is perhaps on the slight end of its optimal drinking window, but then I run into bottles like this that are simply magnificent. Perfume, silkiness and length are the signatures. The 1982 isn’t a powerhouse, like the 1971 or 1978, rather it is a Barolo of exquisite finesse and persistence, much like the 1970, another wine I adore. Hints of rose petal, cedar and tobacco linger on the exquisite finish. Because of its price and scarcity, Monfortino is often tasted rather than drunk. What a pleasure it is to enjoy a few glasses of this magical elixir with two friends over a leisurely lunch in Serralunga, not too far from where the fruit was harvested during the epic 1982 vintage. 97/Drinking window: 2014-2024.